Welcome to the Small Engine & Garden Tractor Pulling Tips & Tricks Websites! Click here to make a donation through PayPal if the valuable information in this website has helped make your life better. Where Science and Common Sense Come Together for Improved Engine and Tractor Performance. These are the Essential Web Sites That Every Small Engine Enthusiast and Competitive Garden Tractor Puller Need! The associated links below are very popular websites! So be sure to bookmark THIS PAGE before you continue! No registration or password required, no automatic popups, no spyware, adware, viruses, Trojan Horses or malicious codes inside. If you have any problems with any of my web sites, please let me know and I will correct it/them immediately! All of my web sites are easy to navigate, too...no tricky links or shenanigans! 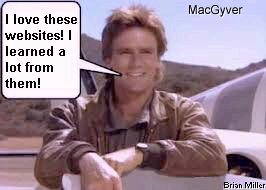 Also, all my web sites are educational, easy to understand, safe and enjoyable to read for all ages! The information in my web sites is more understandable and direct than any Kohler or Cub Cadet publication. And it's best to use the newest version of Google Chrome or Microsoft's Internet Explorer web browsers to experience all the effects of my web sites. Optimized for 1024 x 768 screen resolution. To search for a word or phrase in any of my web sites, press CTRL and F to open the Find dialog box in your web browser. Whenever I perform a tune-up on a small engine, the very first thing that I check is the compression. I crank the engine over by hand or by pulling the rope slowly to feel for slight resistance when the piston comes up on the compression stroke. Because if it has a broken rod, then that's another story. But if the compression feels adequate, then I check the condition of the spark with a fixed-gap spark tester (not an inline spark tester). If it produces a strong spark, then I test the spark plug that came with the engine for a strong spark as well. If it has a strong spark at the spark plug's tip, then I check the flywheel key to see if it's not sheared. If it's in good condition, then I move on to the carburetor. I remove the float bowl to see if there's any dirt or water in the gas, and I smell the gas for freshness. I also check the carburetor mounting and intake tube to make sure it's fastened tight to the engine block to prevent a vacuum leak. If any of these things are at fault, then I correct it. I do all of these things in this order on every customer's lawn mower that comes in my shop to rule out all possibilities. Because working in reverse gets very little done. And I have never used starting fluid (ether) on any engine that comes in my shop for repairs. Because I figure if an engine will not start on gas that's in the carburetor, then it will not start at all. If you would like to purchase any of the parts or services listed in the linked websites, please contact A-1 Miller's Performance Enterprises | 1501 W. Old Plank Rd. | Columbia, MO (Missouri) 65203-9136 USA | Phone: 1-573-256-0313 (shop) | 1-573-881-7229 (cell; when leaving a voice message, please speak slowly when giving your phone number). Please call Monday-Friday, except holidays, 9am to 5pm, Central time zone. If no answer, please try again later. (When speaking with Brian, please be patient because I stutter.) A-1 Miller's shop is open to the public from 9am to 5pm, including weekends, except holidays. Please call before coming so I'll be here waiting for your arrival. E-mail: pullingtractor@aol.com. Directions to our shop | 1501 West Old Plank Road, Columbia, MO - Google Maps or Map of 1501 West Old Plank Road, Columbia, MO by MapQuest. If you're the kind of person who don't trust delivery/shipping companies (mis)handling your high-dollar and fragile merchandise, you can make the long drive to A-1 Miller's shop to personally drop off and/or pick up your carburetor, clutch assembly, engine, transaxle, tractor, etc. "The road to a friend's house (or shop) is never long." (We're planning to relocate to other property with a bigger and better shop so we can provide many more parts and services.) Please click here to place an order. To place an order, please call the number below Ê or send an email with your name, complete and correct postal address and phone number and so I can figure the total with shipping cost and USPS Tracking. For payment options for parts ordered or services performed, or to make a donation to my websites, I accept cash (in person), USPS Postal Money Orders, cashier's checks, business checks, MasterCard, VISA, Discover, American Express (please add 2.5% to the total for the credit/debit card processor's surcharge), Western Union Money Transfer, MoneyGram Money Transfers or Popmoney. (If a part for a specific purpose is special ordered, your debit/credit card may be charged for the full amount or as a deposit right after your order is placed; please do not send your debit/credit card information in email!) Or you can pay me through PayPal. (My PayPal account name is my email address. And be sure to mention in PayPal a description of what the payment is for.) If sending a money order, please include a note in the envelope with your name, complete and correct postal address, phone number and a description of what the payment is for. My mailing address and phone number are below Ê . I'll make a note of your order, and I may have to order some of the parts, which should take a few days to come in, but I will send the parts to you as soon as I have everything in stock after I receive your payment. IMPORTANT - When sending your part(s) to me for rebuilding or repair, package everything securely so the item(s) won't get damaged in shipping and please include a note in the box with your name, mailing address, phone number (in case I have any questions) and a description of what you want done. When shipping heavy parts, it's best to put a slightly smaller box inside a larger box, to double the strength and integrity of the package. Because the clumsy "gorillas" or incompetent and uncaring workers that work for certain delivery services mishandle the heavy packages and don't care. And when the work is completed, I'll either call or email you an invoice with the total including shipping and handling. To figure the shipping cost, I weigh the package with the parts, then I go online to the USPS Postage Rate Calculator website. I type in the weight, my zip code and your zip code, then it shows me the prices for various ways to ship the package. I always choose US Postal Service because I believe that's the most fastest, economical and reliable method. To save you shipping charges, item(s) in a package or cushioned envelope weighing less than 13 oz. is sent by First Class Mail for a 2-6 day delivery. Most packaged item(s) weighing over 13 oz. is sent by US Priority Mail for a 2-3 day delivery. To save you even more on shipping heavy items, I always try to use the US Postal Services' Flat Rate Priority Mail envelope and boxes (if the item(s) can fit inside the envelope or boxes). Some heavy items weighing no more than 70 lbs. is sent by US Mail Parcel Post. Item(s) weighing over 70 lbs. is sent by FedEx Ground. Again, if you're the kind of person who don't trust delivery/shipping companies (mis)handling your high-dollar and fragile merchandise, you can make the long drive to A-1 Miller's shop to personally drop off and/or pick up your engine, transaxle, tractor, etc. Item(s) in a package or cushioned envelope weighing less than 1 lb. is sent by US Postal Service Airmail Letter Post for a 4-7 days delivery. Packaged item(s) weighing over 1 lb. and up to 66 lb. is sent by US Postal Service Airmail Parcel Post for a 4-10 days delivery. I cannot use the US Postal Services' Flat Rate Priority Mail envelopes and boxes to ship outside U.S. territories. Item(s) weighing over 67 lbs. or more is sent by FedEx Ground or equivalent services. To make a payment to me through PayPal, go to PayPal's secure website ( https://www.paypal.com/ ) and click on Send and Request -> Pay for goods or services. Type in my email address, or copy and paste this: pullingtractor@aol.com, the amount and follow the directions. Be sure to mention in PayPal a description of what the payment is for. After you've finished, PayPal will send me an email notifying me that you have made a payment to me for the product(s) or services and amount entered. Then I go to their website and direct PayPal to deposit the money in my bank account. And I will send the parts to you as soon as I receive your payment. But I may have to order some of the parts if they're not in stock, which should take a few days. In that case, I will send you the parts as soon as they come in. PayPal protects your financial privacy and security. With PayPal, privacy is built in. It's a way for you to pay without exposing their financial information. 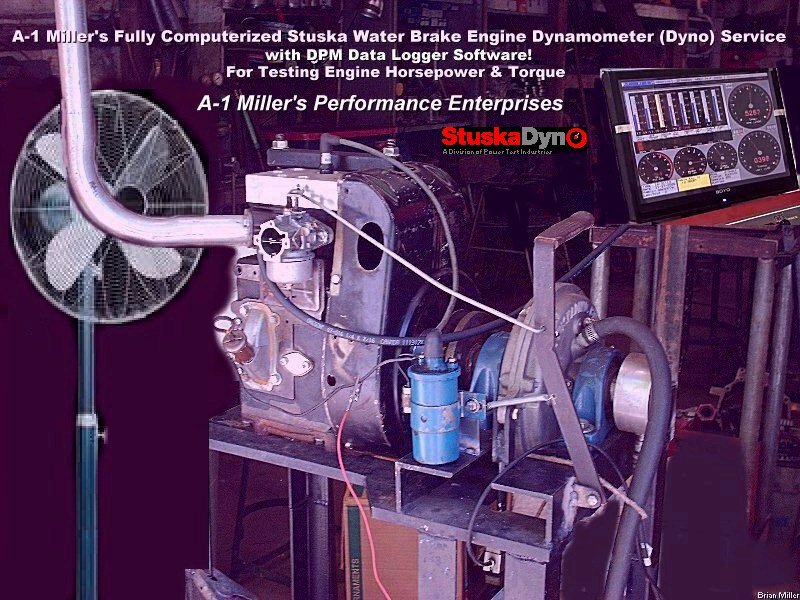 A-1 Miller's Fully Computerized Stuska Water Brake Engine Dynamometer (Dyno) Service with DPM Data Logger Software! For performance testing engines up to 200hp at speeds up to 12,000 RPM. The only engine dyno service in Missouri for Kohler pulling engines! Fully operational and 100% accurate, customers can rent dyno time, fine tune and make adjustments or changes to their engines to gain maximum horsepower and torque, and print-out the results so their tractor(s) will be truly competitive on the track. With an engine dyno, the puller can adjust their engine to get maximum horsepower and torque, and gear their tractor appropriately to have an advantage over the competition. NOTE: A fresh-built engine may not produce full power until it's broke-in. This is when the valves wear-in with the seats to completely seal in the compression. The rings will likely hold the compression, but the valves may leak slightly until they wear into the seats. This is normal for all engines and may take several hours or pulls to happen, then the valves will be able to hold full compression. Lots of pullers tell me after I've built their engines that it seems to pull stronger every time they pull it. Engine Dyno Rental Fee: $50.00 per hour run time from the moment the engine is started. No setup fee for Cub Cadet engines with a 3- or 6-pin/stud clutch driver. An adapter may need to be needed or fabricated for other makes and models of engines. Only engines with the narrow base oil pan can be tested. Engines with the wide base (tall) oil pan cannot be tested at this time.